Good Monday Morning. Time for another Buffalo Stamps and Stuff Monday Challenge. 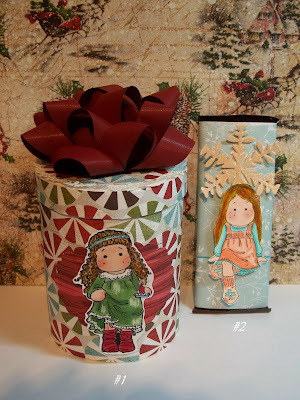 Your challenge today is to make a small Christmas gift. Do you feel like just yesterday was Thanksgiving and tomorrow is Christmas. There is just not enough time in between these two holidays to do everything that you need to do. So, today, I thought I would show you five small gifts you can make before the day arrives. These are nice to have on hand. Great for neighbors or friends. The first picture shows all five. In the second picture are the first two. #1 is a small wooden round box bought at the craft store. Covered with cardstock. The Magnolia image is colored with Copic Markers. Box is topped with a purchased bow. Inside? Packages of Swiss Miss hot chocolate, but you could fill with whatever you wanted. #2 is a covered Hershey's Chocolate Bar. Measure the bar and cut a piece of cardstock to make a sleeve for the bar. I added this Tilda image, from Magnolia, and the snowflake. Kids love these and they are nice to have on hand if anyone stops by for a visit for the holidays. They look great in a glass bowl too! #3 is a small organdy bag from the bridal dept at the craft store. I filled it with Starlite Mints. 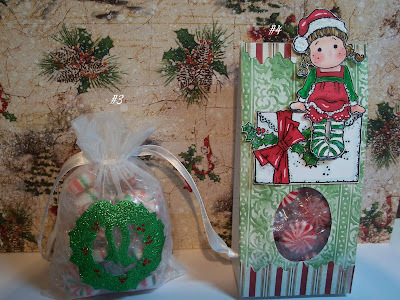 The wreath is a cuddlebug die and matching embossing folder. I used glittered fun foam to cut the wreath then added red stickles for the berries. The fun foam is from the craft store and is self adhesive backed! And it is really sparkly. #4- The small tent box from the Wilton cake decorating dept at the craft store was run through the new large holly die cut from Cuddlebug while it was flat. I then popped it open and ran a sponge with green ink lightly over the front only. I added the stripped paper with the edge cut with decorative scissors to the top and bottom. 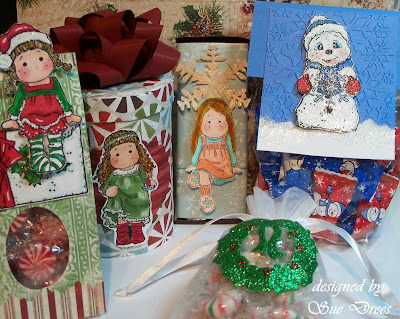 The images are both Magnolia, Holly Letter and Santa's helper. Colored with Copic markers. Filled with starlite mints or anything else you want to put into it. #5 - I filled a clear treat bag, also purchased in the Wilton cake decorating dept at the craft store, with Butter cream wrapped mints (from JoAnn's). I cut a piece of cardstock 4 inches by the length of the folded over top edge of the bag and fold in half and stapled it to the clear bag. I colored the Magnolia image of Snowy with Copics, embossed over the whole image with Sparkly embossing powder. 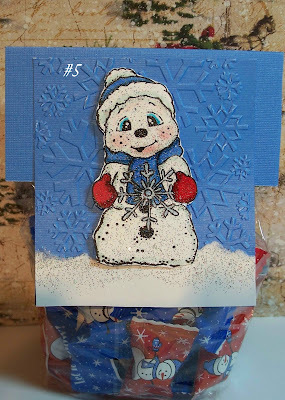 I cut him out and mounted him to a panel that I ran through the cuddlebug embossing folder, snowflakes. I tore a small piece of white cardstock for across the bottom, also embossed with sparkly embossing powder to look like snow. I adhered the panel to the bag topper. These were quick and easy projects with eye appeal. You can really dress them up with a minimum of time. Hope this helps with last minute "stuff" or stocking stuffers. Thanks for checking in and happy stamping. Ah ha!!! So this is what you've been up to!! Each is more wonderful than the next, lovin' the beautiful vintage-esque look of #4, snoowie couldn't look any more perfect with the mints (that sound yummy!!! ), cute cute cute!! Have a wonderful week Sue!! Beautiful! Just the CASE I needed!!! Thanks Sue! Ohh wowww Sue,what beautiful,i love your images and colours. Just wonderful! You have been one busy lady. I love it all. It is hard to pick a favorite. Gosh you've been a busy little bee! These are wonderful, what a great idea! Haven't time to do them now - but try this next year.